"The glittering treasure you are hunting for night and day lies buried on the other side of that hill yonder." Joe explains to Mick how our world is vaguely shaped like the human cranium. 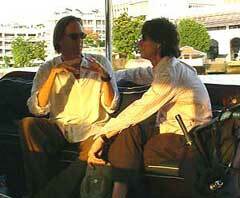 When Mick Jagger's staff contacted me and asked if I could spend some time with Mick in Bangkok, I was both thrilled and apprehensive. At the time the Rolling Stones were rolling through Asia on their Forty Licks tour, and vocalist/frontman Jagger was taking time off to travel privately in Thailand. Guess which book is perennially found among the top three titles on Australia's nationwide list of the most shoplifted books? Why does Leonardo DiCaprio's character in the 20th Century Fox movie, The Beach, say, "If I ever meet [Joe Cummings] I'm going to punch his lights out"?